I used green asparagus (white is unfortunately hard to come by here), and shortened the simmer time to about five minutes - just perfect for plump green spears. 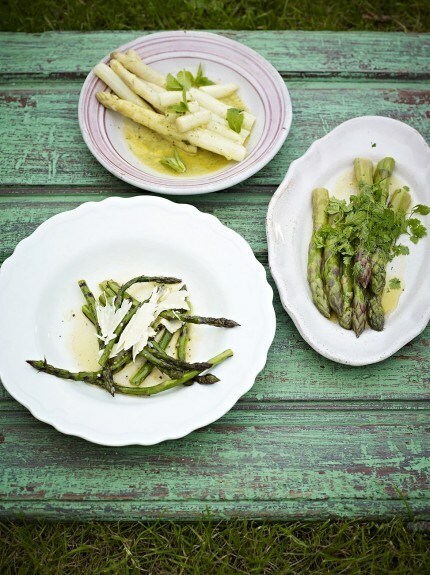 The mint and lemon butter was tangy and fresh, the perfect match for any asparagus. My four-year-old loved it so much, he ate six whole spears, and that really says all you need to know right there. 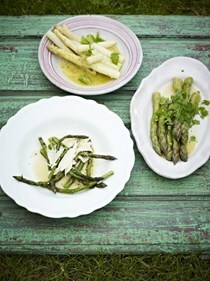 This hardly counts as a recipe, it's so basic, but it is a great way to eat asparagus. I broiled mine about ten minutes instead of dry grilling them, so tossed the spears with olive ail, salt, and pepper before they cooked, then squeezed the lemon juice and sprinkled the parmesan shaving over them. Agree with previous review, but very delicious and easy. Don't use too course sea salt! 5.13 Yum, quick easy - poss use vinaigrette for other foods. Fantastic breakfast, although I agree with Jamie that you could eat it at any time. I used one bunch of asparagus and some thin slices of pancetta. If you need to use olive oil only use a tiny dash as the fat in the pancetta will be rendered off anyway. Cook the eggs in simmering water for 4-5 minutes. Added a bit of cream to smooth up the texture. I don't feel I can accurately rate this recipe, as I made a few changes. I didn't have Lancashire cheese, so substituted goat cheese because I had it on hand and figured the flavor would be a good fit. More significantly, I was out of eggs, so left them out completely and added some extra whole milk to the potato/cheese/cream mix to make it a little more spreadable. While the potato mix tasted good, it was, as Jamie might say, a bit "stodgy" on the tart, and the phyllo dough underneath didn't crispy up well. Next time, I'll be sure use the eggs as written. p.30 - A wonderfully appetizing photo in this book tempted me into making this super-quick, easy and delicious dish. Jamie serves these alongside bacon however I took a pass on the meat this morning as we felt the crumpets would be adequate. Prep couldn’t be simpler. Olive oil is heated in a non-stick pan and eggs are whisked w S&P and fresh chopped chilli. I used one Thai bird chilli for 4 large eggs. Crumpets are coated in egg mixture and allowed to really soak it up into their crevices then they are placed into a hot pan and cooked on both sides until nicely golden. I served them w some sliced fresh tomato and sprinkle of sea salt. They were crispy on the outside and so tender on the inside. The chilli was a fabulous addition. I’ll definitely make these again. They’d be great to serve to overnight guests as they’re a little different or, would make a terrific breakfast for dinner too. This is a great recipe, I suspect even if you've never used your crank pasta machine you'll manage to make a delicious meal. I made a 4 egg / 400 g amount of pasta and it was almost twice as much as three people could eat. That's okay, more for later! I used all semolina for the dough, and then switched to AP flour for dusting. 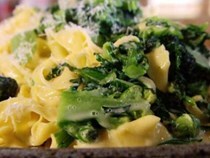 I also used kale along with some broccoli in place of the purple sprouting broccoli called for in the recipe. If you've never made pasta before and want a bit of a peptalk, I suggest searching youtube for the 'eggs' episode of the "Jamie at Home" show. I'll definitely make this again. First: This cheesy sauce and broccoli combination is genius, and I love how Jamie instructs you to melt the cheeses in a bowl while bringing the pasta water to a boil, then cook the broccoli and pasta simultaneously, finally stirring the cooked broccoli and pasta directly into the bowl of cheese sauce. I used Gruyere in place of fontina. Perfect! Unfortunately, the U.S. edition has an error in the ingredients. The recipe calls for 4 eggs and two cups of flour. 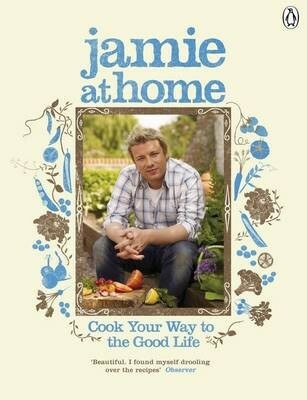 However, in the forward, Jamie estimates you should use "1 egg to 1 cup flour per person". Hmm. I didn't have much more than two cups white flour, so followed the recipe even though the dough was disconcertingly sticky. To keep it from tuning to total mush as I ran it through the pasta roller, I ended up using a lot of additional whole wheat pastry flour. Fortunately, it came out OK, but I will make sure I have four cups of flour on hand next time. I made this again, this time with truffle cheese (nice!) and sprouting kale and cabbage in place of the sprouting broccoli. I used duck eggs, and still found that about one cup flour per egg was needed, despite the larger size of the duck eggs. This makes a massive amount of pasta, probably enough to serve six to eight people. This has now become my favourite dinner party dessert. Everyone who gets served this will definitely go "WOW"!! And the flavours do not disappoint. But, as melissabazley says, there is a LOT of topping ingredients so that by the time you layer it all on, its way too much. 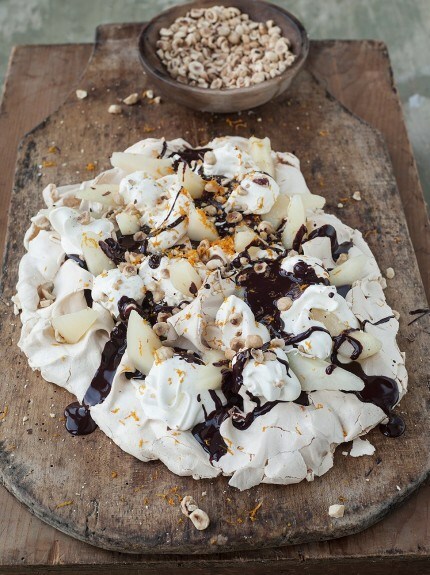 WOW, this is a super rich, decadent pav. I think you could poach your own pears if you had the time. For something a bit tart to cut through the sweetness, I'd use mixed berries instead of the pears. Love the addition of stem ginger. Adds great, subtle flavour. I made it with only 1 layer of topping as 2 layers of was just too much...a great special treat. I loved this recipe. Could also make them with beef. I made some hummous to go with it and it was superb. 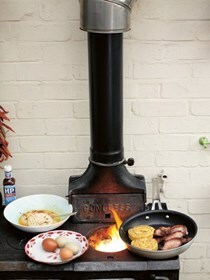 Great summer BBQ food. I've been making these for years. Usually I make it with ground lamb by combining everything except the lamb in a food processor then mixing in the ground meat by pulsing it a half dozen times. My handful of pistachios is more like a double handful, and into the mix I also add a roughly chopped garlic clove and a sliced shallot as well as a little olive oil. I've found that even when I eyeball the spices it tastes great. If you can possibly cook them on a grill do it. Must make Tzatziki to go with! The whole family really enjoyed these kebabs. I used ground turkey and cooked them under the broiler, which worked great. They would lend themselves well to any yogurt, hummus, or tahini topping. I even made fresh flour tortillas to go with them, making the dish extra delicious. Great lamb recipe - tender and falling off the bone. Add lots of rosemary while in the oven. 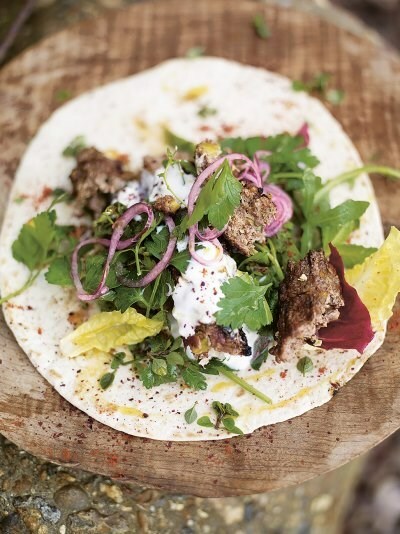 I serve this with roast vegetables and keep the leftover lamb for lunches. Mum has made the accompanying sauce once but I don't think it's anything special. 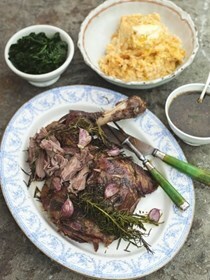 My favorite way to cook lamb - fall off the bone tender. I also quarter an onion and slice a lemon and put on top and bottom for roasting. I'm not a fan of mint, so I leave it and vinegar out of gravy. Save some of your potato water and mix with flour to make a slurry to thicken - finish with a pat of butter off heat. The mashed veggies are great and even my hubby who hates cooked carrots will inhale them. I usually serve with roasted asparagus and not the greens. Good, but more work than it sounded like. I needed three extra ramekins - Jamie's must be bigger than mine. 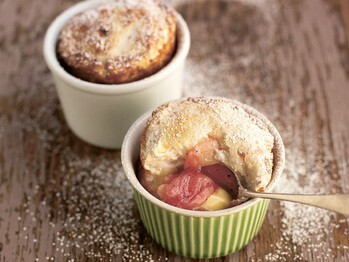 I had about half the required amount of rhubarb so I added granny smith apples to the mix. I also increased the amount of crumble (1.5 x recipe quantity). Delicious! 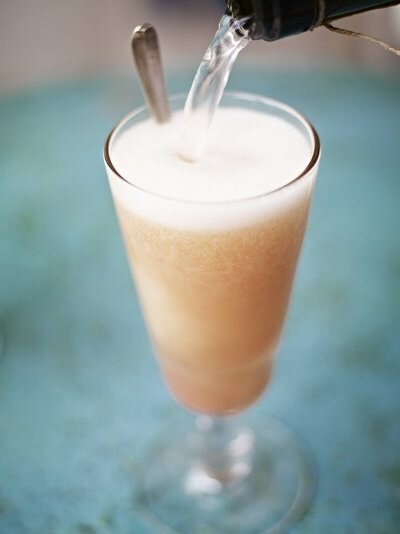 Made this with only rhubarb. Very easy recipe and taste was okay, crumble with oats was good, but did not taste the ginger. I'm going to add more next time. Add the orange juice sparingly, it can curdle the cream. 10.13 Alright - would be good served as quick, easy bbq side. This recipe is great, only I have decided that I REALLY HATE anchovies and that was all I could taste !! I will leave them out next time and enjoy this dish SO much more !! Used smoked ham shanks since it was the closest I could find. The mix of flavors in this dish was delicious; I found it to be a creative use of carrots and ground meat (I used ground turkey). I used plenty of cilantro and mint, which added some bright, fresh notes to the salad, contrasting nicely with the warm spices in the meat. Toasting the sesame seeds to a deep nutty brown also added great flavor. Since I didn't have much garam masala on hand, I used Madras curry powder, and left out the cumin seeds as I didn't have whole cumin. Slicing carrots wafer thin by hand can be a bit time consuming, but is something that could be done in advance. My three-year-old happily ate the meat on its own along with some plain carrot slices, as the dressing was a little much for his palate. Update: I have determined the best way to eat this salad is to mix the carrot salad and meat together in a bowl. You can even throw in some additional greens, and the carrots do well the next day when softened from marinating in the dressing. Very nice. I followed the recipe but the quantities of coriander and mint that are required are so small that there is not much point unless you have some around. Served with pita bread crisped up in the oven. I thought that the dressing was amazing. I used minced beef instead of lamb as I'm not keen on lamb. The carrots took forever to get wafer thin without a mandolin...I used a "speed peeler", but it wasn't so speedy. This is really three recipes. A simpler meal would be just the pork and one of the roasted vegetables, but doing them all made for a very delicious meal. My husband thought he hates beets, but he thought they were really great like this! 9.13 My chops were too dry - poss try again. Used home grown beans for this and served it on really good bread. It was delicious. Don't be afraid to use lots of garlic! I only made the zucchini, which I quite liked but everyone else thought was weird. One of our family faves. Even teen-aged boys like it, and its a good way to get through some of the overload of summer zucchini. Also good with other veggies added (fava beans go especially well). 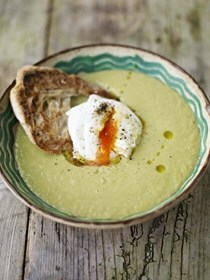 2.14 Scrummy - great use of zucchini. Same amount of pasta and pancetta. Twice as much zucchini. Think there should be even more zucchini. So yum - creamy and full of flavour. The zucchini takes on the flavour of the pancetta while in the pan. I used thin slices of pancetta and shaved the zucchini with a vegetable peeler before chopping roughly. Thyme isn't necessary. No squash in the UK recipe. An absolute household staple. One of the first things I make when zucchini starts coming on in the garden. My only gripe is the nature of the sauce makes for poor leftovers. This is a good soup to prepare in advance, then finish with the cheesy bread topping just prior to serving. It's basically a variation on French onion soup, with cheddar and sage in the supporting role. I used sunflower rye bread. This hearty bread, when paired with extra sharp cheddar and a bowl of soup loaded with onions, made a satisfying dinner just on its own. This soup is good, but it ends up quite sweet. We added some vinegar at the end to balance out the sweetness. Really good. Added crispy bacon on top. Definitely worth double podding the beans. Used parmesan because that's what we had. Definitely do when beans are available. Feels super healthy too! Despite doing just about everything that Jamie advises against (using frozen peas, a food processor and subbing parmesan for the pecorino ) this was delicious. Looking forward to being able to make it next year with fresh ingredients! This was fantastic! I did make some changes, using peas from my garden and no broad beans. I also subbed the pecorino with a strong cheddar and used lime juice because that's what I had. The acid at the end really did bring it all together as Jamie says. The paste tasted amazing and would be good on practically anything; fish would be wonderful I think. I made it by hand, but I would try in the food processor if I did a larger amount. Can't wait to make this again! This is really quick and easy, but it can take longer than you think for the sausage to cook through. It's also a lot of pots to keep an eye on at once, but that's the price you pay for bringing dinner together quickly! I love the pop and sweetness of the fresh peas in this. There aren't that many recipes I make over and over again, but this is one of them! Pizza Margherita… and so much more! These are good calzones. I varied the filling a little; I had only half the amount of mushrooms (cremini) called for, but added some chopped reconstituted dried porcini, used only eight ounces of spinach, included extra tomato sauce, and aded turkey pepperoni. The filling was flavorful and well-balanced, but I found it only made two large calzone, which only used up half of the dough. Since Oliver's pizza dough recipe appears on the very next page, and the calzone recipe called for one batch of dough, I found this rather odd. But oh, well - this means I have leftover dough for another use! I baked the calzones on my baking steel at 550 F, and they were quite black on the bottom after a scant ten minutes in the oven. Fortunately, after scraping them lightly, they were fine, but in the future it might be better to bake them on a pre-heated baking pan. I used Mr Oliver's pizza dough for the calzones and baked 16 minutes at 450 degrees. (The instructions say to put the oven on at full power but don't give a temperature). I changed the filling to suit what I had on hand and they turned out well. It's important to have some flour on the bottoms of the calzone before baking so they don't stick. This is my go-to pizza dough. Whenever we have pizza...this is it. I only make 1/2 the amount and it makes 2 thick crust pizzas perfectly or 3 thin crusts. I had to add an extra 60g of flour to the dough as it was very sloppy without the addition. This is a good basic dough, although for pizza I prefer to use one of Ken Forkish's recipes from The Elements of Pizza. But for the calzone recipe in this book, and for something you can easily throw together and put in the refrigerator before work, this is ideal. Have used this recipe for years and never failed. It freezes very well in balls wrapped in cling film. I have hand-kneaded and used my KitchenAid with a dough hook. Perfect - for pizza sauce, this is really all you need. To make it even faster, you can used good quality crushed tomatoes. Super yum and tasty...don't really need to strain the chunky bits out. Great flavour. Makes enough for 6 pizzas, I just make 1/3 of the recipe for 2. Simple, but you may end up using every dish in the kitchen. Salt potatoes well. Also I used half as many chicken thighs (3lbs with bones). A good recipe with plenty of left-overs for lunch the next day. This is an easy and very tasty recipe. As the potatoes are precooked I was able to use some left over from the day before, 4 thighs are plenty for two. I thought that 40 minutes oven cooking seemed too long as the thighs that are cut into strips had already had 10 minutes in a pan, so timed it for 20 minutes and then left them for 5 minutes in the turned off oven while I prepared a green salad and that was plenty long enough. I used chervil instead of oregano as I had just dug up a large plant from the veg garden to make way for spring planting ! Very easy and good. It's important to salt the potatoes well. I don't bother peeling the tomatoes. I love this recipe, it's so adaptable. Virtually any variation is as delicious as the last. Leftovers are still tasty. Very tasty, and open to so many potential variations. It's really important not to crowd the pan. You will probably have to use two if you don't halve the recipe. Tasty recipe, very easy to put together. Yum! We really liked this. Used only 8 thighs and had plenty leftover - after serving 3 adults (and one dog). Didn't change anything about the recipe and served with arugula as recommended. This is a great dish for this time of year, as variety of cherry tomatoes and new potatoes are fresh and good right now in the northwest. Good weekday fare. Subbed cauliflower for the potato to lower the carb content. I thought the shallot was a bit overpowering - next time decrease the amount. It was good. We fried the shallots with the chorizo and added the parsley to the egg mixture. Once it was cooked, we squeezed the lemon juice over the top...only 1/2 a lemon though ! May need wild strawberries. Tasted like a gin martini when I used regular strawberries. 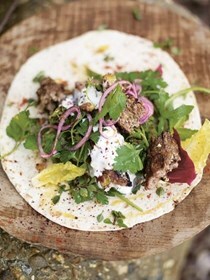 This is a great idea for using up a mishmash of different herbs. It worked well with hothouse cherry tomatoes, but would likely taste even better with fresh summer tomatoes. The individual parts of the bruschetta - toast, tomatoes, and herb salad - could easily be packed separately to bring on a picnic lunch. I found this Caesar salad quite different to what I am used to and very tasty, although perhaps a little too salty overall. The dressing was so intense that we only used half of it. The croutons were the best part. 1.14 Too rich for me - I found the croutons cooked in chicken fat a bit much- use Chelsea's recipe. oh my goodness...YUM. This is excellent. So tasty. Packed full of flavour and it's so good for you too. Also great with pasta, for bruschetta or just as a salad on it's own. Highly recommend. So tasty, quick and easy. A favourite summer dish. This came together amazingly quickly and is such a great use of my garden. I'll definitely be making this frequently in the summer. 2.14 Scrummy - used Black Raspberry Vinaigrette. A brilliant fresh, light, healthy dish. I added a bit of olive oil to the salsa, I also used about half the tomatoes (500g instead of 1kg) and it was plenty. Really love all the fresh herbs too. I put the salsa with fresh cooked salmon...to die for. 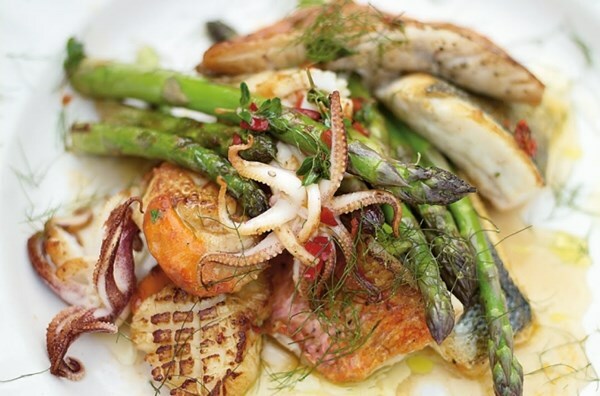 A brilliant, quick, tasty dish for those warm summer nights. What a recipe. 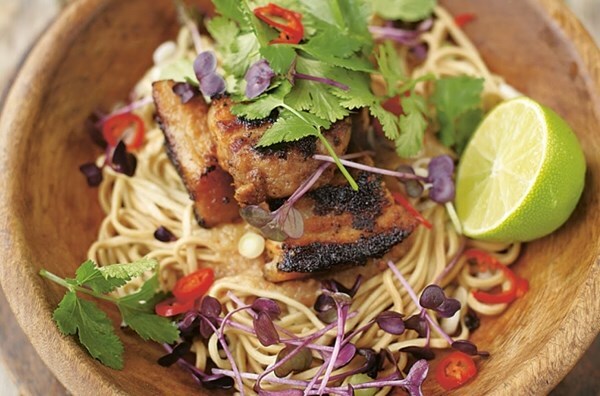 Super easy, super tasty and packed full of flavour. 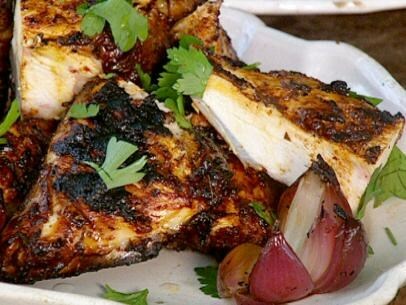 I have shared this recipe with loads of friends. It's just brilliant. Very little effort for huge tasty results. I used only 1.25kg cherry tomatoes and allowed 2 sausages per person. Best thing I've cooked in a long time !! Cheers Jamie ! One of my top ten recipes! Fresh, easy and full of flavor. The tomatos taste better than candy! Sometimes I make it without the sausage as a side dish and add a little cooked pasta - absolutely wonderful. Love this recipe! One of the best sausage recipes ever ! The tomato sauce produced is very intense and full of flavour and makes very good use of one of the best summer ingredients - home grown cherry tomatoes ! We served it with buttery new potatoes and green beans. This recipe will most definitely be added to the favourites list. This was easy and good. Needs to bake for at least an hour. Used fresh turkey Italian sausages, mixed cherry tomatoes. Crusty bread a must with this dish. 12.13 Super simple and scrummy - one of our fav sausage dinner recipes - turns even bland recipes into something tasty. I agree with the other reviews - this is delicious. It's also very easy to make, and involved little clean up. The roasting time is fairly long, however; mine was in the oven for just over an hour. I served it directly from the oven without thickening the sauce. The juices were wonderful spooned over bread along with the tomatoes. It's also an easy recipe to scale up or down in size. Definitely one to make again. I didn't bother to smoke the salmon (I don't have a back yard & didn't want to stink the house out) We cooked salmon by frying it and finishing it in the oven. Totally love salmon!! The salsa was great too...I used 1 lebanese cucumber, instead of the 1/2 suggested in the recipe. A great quick, healthy, tasty recipe. This dish really came together nicely. I was a little skeptical about topping toast with what is essentially a vegetable-forward stuffed pepper, but the peppers were perfectly tender and easy to eat. The bread soaked up all the juices wonderfully. I used winter grocery store produce, which wasn't bad, but made with local veg in late summer, I'm sure it would be fantastic. Over the peppers, I laid a slice of good quality turkey bacon, which crisped up in the oven and was a good contrast with the veg. While simple to make, the peppers have to bake for almost an hour, so plan accordingly. This is a rating for the creamy potato and celeriac. I'm not one to use heavy cream for weeknight dinners, but this recipe was WELL worth it. Despite it being both incredibly satisfying and simple, I give credit to the Cooking Channel's website for providing the correct instructions and ingredients. I recommend searching for it on their website and comparing to your book. The potatoes/celeriac are to be cut into pieces just under 1 inch, not the measurement given in the book. Also, no added butter goes into the sauce, despite its confusing placement at the top of the recipe. One more thing is the parmesan cheese. According to the episode on tv, we're to add half to the sauce, then sprinkle the other half on top (and finish with some fresh if you want). The book instructs you to add half of it, then the other half, then half again. Also, I believe the FRESH sage is key to its subtle aroma. Despite the clear lack of editing, this is a great dish. p. 292 – I used bison instead of venison but it turned out wonderfully tender and worked really well in this dish. This wasn’t like stroganoffs we’ve had in the past in that the sauce was quite thick. JO suggests serving this over rice and while we typically serve stroganoff over noodles, we took Jamie’s advice with no regrets, since this sauce wasn’t as loose as those we’ve had in the past and, I don’t think it would have worked as well w noodles. We especially enjoyed the sweetness and subtle tang the gherkins brought to the final dish. The bison and mushrooms made a very hearty and satisfying meal when mixed w the sour cream. If I were to change anything for the next time around, I might add a spritz of fresh lemon juice to the final dish as we didn’t notice the zest having any particular impact and I do think the brightness of the lemon would have been a nice counter to all the richness. This was a great, rib-sticking meal for a freezing cold stormy night! Very tasty combination of sweet, bitter and sour. Delicious and easy. The fruit for this is brilliant. I used apples, white nectarines, cherries & plums when I made it during summer. SOOOOOO delicious. I now use this stewed fruit for making crumbles and cobblers. It's magnificent. Very vesatile and flavorful chutney. I have used it with roast pork, on sandwiches and love it on pizza. It has become an unusual yet tasty addition to many things. I've been having fun thinking of new ways to use it. delicious, quick and easy food for a cold Saturday night curled up on the couch with a good movie. Brilliant "pub grub"
Substantial and tasty. I used red onion marmalade instead of the chilli jam. On the list as a good lunch. Might be brave enough to douse in the Worcestershire sauce next time. I only made the leeks in this recipe, and had it on toast. This was absolutely delicious! The leeks are cooked in oil and butter with thyme, garlic, and pancetta. I had some smoked bacon so I used that in place of the pancetta. Since my bacon was quite thick, I did have to fry it briefly at the end. A wonderful way to eat leeks, and I can imagine lots of ways to use them. Looking forward to making the entire dish, and I'm sure it will be excellent. I used asparagus as I couldn't get baby leeks, and pancetta instead of normal bacon. Was declared a success by all! I thought this was good but Scott declared it "delicious"
An easy and tasty way of cooking fish, I used cod fillets but make sure it doesn't dry out. Really rich and flavourful. The PERFECT pie! What a superb pie !! So delicious and tasty. If feeling lazy, just use packaged puff pastry. I also added more mushrooms (as I love them) A great winter dish...or anytime really !! p.342 - I actually made this a year ago but forgot to post! Gosh this was good - really, really good! Oh, and the house smelled amazing! Now this isn’t a dish you can whip up after a day at work, nope not at all. JO has you braise it for a couple of hours so this dish needs time. I worked from home today just to accommodate this pie! I have to say I was skeptical when I read the meat wasn’t floured, I couldn’t imagine making a steak pie without doing this. That said, I thought I’d put our fate in JO’s hands and went w his idea. What emerges from the oven is a fabulously aromatic, rich and truly scrumptious bit of steak pie heaven. The flavours were well balanced and I was especially surprised by the deep, rich flavours in the sauce given that the only liquids added were Guinness and water. Hat’s off to JO and the Irish, this was a huge hit. The best pie I've ever made! You can taste the beer but it is not at all overpowering, and the meat was meltingly tender. I used sirloin tip roast. I'll be making this again and again. A fantastic tart. The amount of filling needed 2 tart bases...I didn't have the same sized dish as recipe said. I used 2 23x30cm trays. I needed 1 quantity of the pastry. The pastry is fantastic and I will be using it for lots of savoury tarts and pies in the future. I would recommend adding the sun-dried tomatoes. An easy recipe to convert to vegetarian as well. This is a great tart, despite the fact that I goofed on the pastry recipe and only included about half the butter. Because of that, I think I didn't roll out the crust as thin as it should have been, and I ended up using the entire batch of savory pastry. The tart filled about two-thirds of a half-sheet pan. Oddly, the kids didn't like it, but maybe that was just the spinach and onions. Delicious pie, would make again. I used frozen blackberries. one of the best short crust pastries ever...great flavour additions. A favourite and well used pastry in my house. A very good shortcrust pastry, it tasted delicious. I can't yet rate this recipe yet, as I mistakenly used only 7 tablespoons of butter in the dough rather than seven ounces! I'm not sure how, but I didn't catch that mistake until I was rolling out the dough to make Oliver's ham and spinach tart. Using less butter meant I needed to add a lot more milk, which was hard to fully incorporate into the dough without over-mixing. Fortunately, it still worked, but I am sure it would bake (and taste) better when made correctly. A fantastic pastry with many flavour options. I use this as my basic pastry, it's brilliant. I made this with my last 2 honey nut squashes (mini butternut) from the garden. It was straightforward to make and took about an hour from start to finish. The only other changes I made were to use my own roasted tomatoes for the sundried tomatoes, and to sprinkle the goat cheese on top. 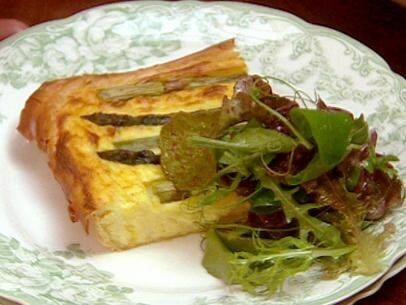 This is a very nice and tasty dish, it is quite filling, and would be a good choice for a vegetarian supper. 2.14 Scrummy - but green squash a bit dry. I have made this many times and it is a family favorite. We made this soup last night with (part of) a blue hubbard, and it is absolutely fantastic. And this comes from a household with a well-honed favorite squash soup recipe. Use the best winter squash you can find. I highly recommend this! An excellent recipe, although they are more cupcakes than muffins. I peeled the skin from the butternut squash & grated it before putting it in the food processor. I added 1/2 teaspoon of ground cloves as well. I would add the walnuts, chopped, after processing all other ingredients together. I used 330g brown sugar instead of the 350g. I used a citrus cream cheese frosting -30g softened butter, 70g softened cream cheese, zest of 1 lemon, 240g icing sugar, squeeze lemon juice - mix until smooth. Will definitely make these again. They'd be great for Thanksgiving treats. My kids love these and I made them today for Halloween. I tried the frosting for the first time, as well, and it is very runny, I wouldn't bother with it again, plus I needed to add more icing sugar to make it taste nice. Nice but I don't think I would make it again. For me it wasn't worth the effort. 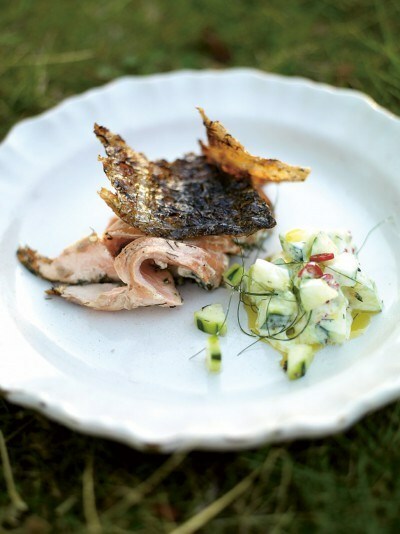 This same recipe appears in the March 2013 edition of Food & Wine magazine, although the book version, true to Jamie's style, is less specific with some of the measurements and ingredients. 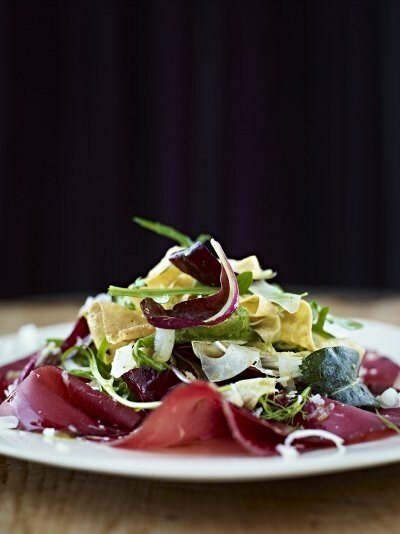 You can definitely make this salad your own and still have great results. It's a salad full of rich flavors, and makes for a substantial side dish or light meal; you just need to plan for enough time to cook the carrots (a little over half an hour total). You can improvise with any number of greens, and I enjoy adding pumpkin seeds. I've made this twice now, though only the roasted carrots. I found that I liked only 1 tsp of cumin and about 4 garlic cloves. I also added a few coriander seeds and substituted fresh Serrano for the dried chilies. I really liked the white balsamic I used, though I'm sure the vinegars called for would be great too. This was a fantastic, tasty salad. My changes; I used lime instead of lemon, and omitted the greens and sour cream. I also prepared the carrots and dressing up to the oven step the night before. I found the dressing on the baked carrots to be almost enough and didn't really use the extra citrus juice that much. Also, mine was a little bitter. Next time I will omit the citrus from the bake and just use some fresh orange or lime juice at the end. This salad has such a great flavor and is satisfying as dinner. It has so many layers of flavor and texture, I would have been very happy to be served it in a restaurant. I left off the sour cream, it really didn't need it. The sauce was delicious and unusual, and although I didn't include the full amount of anchovies, but included a little oil from the anchovy jar for extra flavor. It was far more sauce than we needed, however. I would probably cut the recipe in half next time unless I was serving a very large crowd. The sauce reheats well, so it's fine to make in advance. 8.13 I halved quantities and cut back on anchovies. Quite different & tricky to describe - very unusual and tasty. 7.13 Huge quantities - great flavours. Very good, but also make bbq sauce to go with. "Oliver's pace may be dizzying, but his joie de vivre is contagious. So it's hard to hold it against him when, as is bound to happen, his boisterous recipes show signs of some overly speedy testing. " I liked the batter recipe that Jamie suggested though – it uses white wine instead of water, I wasn’t so sure until I tasted it, but it was lovely!